Current Students: If you are a current Better Day Yoga student and want to purchase any of the products below, please email me and I’ll invoice you for the items you would like minus the shipping charges. I’ll then deliver them to you in class. **All Others: Better Day Yoga is only set up to ship to the 50 U.S. States using the PayPal buttons below. If you wish to order any products to be shipped outside of the U.S., please contact me for a shipping estimate and to place your order. I will then invoice you the correct amount. Thank you! Enrichuals© card, a 64-card deck of powerful practices and soulful rituals, deck created by Suzanne Vadnais Monson. Cards designed to jump-start your creative process. Each 6“ by 4” card is a playful assemblage of words and images on one side and beautiful words of wisdom, encouragement and inspiration on the other. Highly adaptable for personal growth and inspiration, group activities or adding value in client relationships. Each deck comes with a booklet of ideas for using the cards and an organza bag for artful storage. Spice up your new client welcome packet by adding a card. 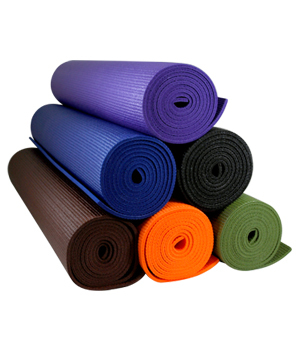 1/4 inch thick Yoga Mat (24″ x 72″). Color availability varies. Please inquire. Created for my students; bottled for sale at their incessant request! Here it is! Enjoy! • …uses are only limited by your imagination! Thanks for making it so popular, everyone! Ingredients: Distilled Water, Basil, Cardamom, Rosemary,Peppermint, Rosewood, Geranium, Lemon, Bergamot, Roman Chamomile, Jasmine, Palmarosa, Ylang Ylang, Sweet Almond, Spruce, Blue Tansy, Frankincense, and Cinnamon Bark. there’s more, but I’ll stop there! My suggestion is to use it to clean the mat—the other benefits are there for my students to enjoy. I haven’t spoken to my students about the energetic benefits—they have just used it and have all commented on how they would love buy it! Thanks for the interest!